Modern-day Wales counts as one of the six areas on the fringe of Western Europe still regarded as ‘Celtic’. A residue label that remained stuck on the Welsh lands as it did on Ireland, Scotland, the Isle of Man, Cornwall and Brittany. These areas do have a lot of historical and cultural aspects in common such as shared linguistic characteristics. Most importantly, the heritage of the Iron Age Celts stayed stronger and survived much more thoroughly in these countries than it did elsewhere in Europe. The history of Wales in the period of the historical Celts and their immediate heirs, the early medieval Britons, comprises most of the book. A concise separate section is devoted to the Celtic myths and mythology, that can teach us also some thing about early medieval and perhaps late Iron Age Welsh society. Because of the fact that in the Iron Age and during the existence of the Roman Empire there didn’t exist states or nations as we understand them now, we cannot speak of ‘Wales’ when we talk about that western part of the island of Britain. The Celtic, British tribes that lived in nowadays Wales had cultural characteristics that were widespread in the whole of Britain and mainland Europe and which eventually got the label ‘Celtic’. I’m referring here to the La Tène material culture that is known from all over Europe. Currently, there is an ongoing debate running among scholars about the question whether or not the terminology of ‘Celt’ and ‘Celtic’ should be used when we talk about certain Iron Age peoples. Suffice it to say that using words as Celts and Celtic still has more pro’s than con’s, so I will, just as the authors of this book do, continue to use them. 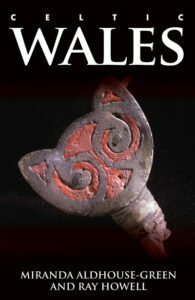 Because of the Celtic origin of early Wales, Aldhouse-Green and Howell devote a whole chapter of their concise book to describe Celtic Wales in the context of the European Celts. This is understandable since the goal of both authors in writing the book was to present the general reader and student alike with a scholarly up to date yet concise study about the early history of Wales. With that in mind, the European context cannot be forgotten. Following this first chapter, we read about the Celts in Wales, the coming of the Romans and their difficult pacification of the Welsh Celts. Especially the Silures in the southeast and the Ordovices in the northwest remained tribes that had to reckoned with. Hereafter the coming of Christianity to Brittannia is treated and the chronological account of Celtic Wales is ended with the early medieval period. Accompanying the narrative are short paragraphs in which the authors deal with some subjects more extensive. In one of them, Aldhouse-Green and Howell discuss an especially interesting hypothesis focusing on the impact of the Germanic invasions in the aftermath of the Roman retreat from Britain. The traditional view has been that the coming of the Saxons, Angels, Jutes and Frisians caused an exodus from southeast Britain to the West. Recent evidence however, shows nothing of the like. Instead, it could have been that the peasant population of southeast Britain adapted rather rapidly to the new situation and their new overlords. One of the causes for this could have been the more romanized situation of the southeast as opposed to the west. The Roman state guaranteed a certain level of law and order and therefore was in a position to force the producing peasantry in an obedient, unarmed position. In the rebellious west of the island this consequence of Roman rule had taken root on a much smaller scale. Therefore opposition against the Saxons was more difficult for the southern Britons both physically as well as psychologically than it was for the Welshmen. For the reader that looks for a thorough introduction into the early history of Wales, and is a bit reluctant to take a vast monograph of several hundred pages to hand, this is the book for you! Scholarly information from renowned writers on the subject, and very pleasantly written.